DD5LP/P – June 17th. 2016 – DL/AM-156 Schneidberg. Ignacio EA2BD suggested on the SOTA reflector a “HF Minimalist / QRP SOTA” event for the weekend of 17-19th. June. The idea being to get all radio equipment down under 1 Kilo (CW equipment) or 2.5 Kilo (SSB station). This is not as easy as it seems and it’s an interesting exercise in seeing what all the weight in the back pack is. I found that with taking only the FT817 with its internal LIPO battery and microphone, my log and pen, the SOTABeams linked dipole and my 5 metre fibre glass mast, I just “creep under” the limit at 2.4 kilos. 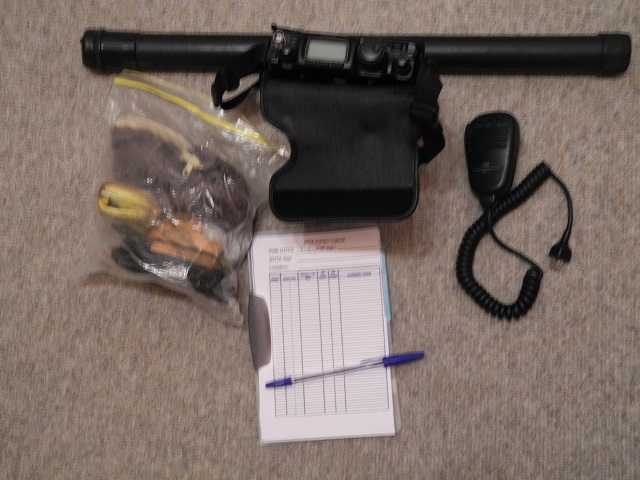 Of course non-radio gear (food,water weather protection etc.) exceeds this amount but the weight restriction is specifically on the radio gear. All equipment was prepared and I only had to wait for a day when it wasn’t constantly raining. The forecast was for a three hour window without rain on Friday followed by Saturday and Sunday raining all day. So there was my possibility – Early afternoon Friday, it would have to be. What actually happened with the weather was that the whole of Friday afternoon and Saturday remained dry and sunny. WEATHER FORECASTERS!! The top right of the map is the end of the “normal” road from Wildsteig which also has a small car park. 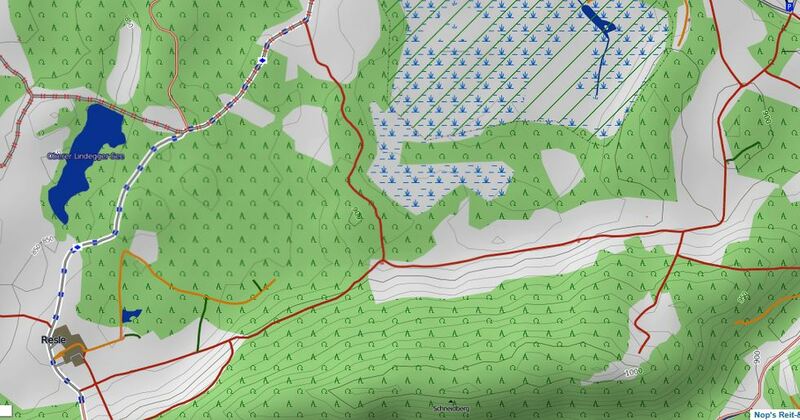 The summit itself is in the middle of the bottom edge of the map, however getting to the end of the red track to its right, puts one in the activation zone from where it is valid to transmit “as if you were on the summit”. My hope was to see how far up the tracks I could get before the road either became restricted or un-drivable. As I did not, at this time, know what was up the road, I decided to play it safe and park in the car park and walk what I calculated would be just a little less than 3 kilometres to the end of the road. As I was walking up the first (steep) section of road, I was pass by a Ute/Pickup truck, which could I suppose have been the farmers family – however the sign did not say “Anlieger Frei” (access for those who live here), the plain circle is supposed to me NO vehicular access at all. On my way back down this same section of road I had to step to the side to let a large tractor past – again it makes sense that the tractor should use this route but the sign means absolutely NO vehicles allowed. Next time, I will ignore the sign as it seems locals do! The walk flattened out a little after about 500 metres and soon after changed from a tarmacced road to a gravelled one – but still 100% drivable with a normal car. Luckily at this point the weather was fine, however I had brought a heavy waterproof jacket, just in case the weather changed. As it turns out extra weight that I didn’t need. after about another 1.7 Km on relatively flat track I needed to turn left to head up to the summit. Interestingly this “track” was in fact a tarmacced road again and it was also steep again, so I guess the steep parts are tarmacced so that they can have vehicles get up them in winter. The total time for the walk from the car park to the edge of the AZ was 30 minutes walking at a fast pace. Needless to say once I arrived on-site, the first thing I did was sit down and take a drink of water as it was now getting quite warm. I set up my station within a wooded area to get a little shade and started off on 40 metres. It was at this point that the cell signla started playing silly. It varied (on two different networks – Telekom & Vodaphone – I have dual SIM phone) from solid 3G coverage to not being able to even send an SMS. This is the first time I have seen these strange situations – I can only guess there was a local source of interference on 900 MHz or there abouts which knocked out both networks. I did manage to get an SMS out to alert my operation which, despite the long walk, I started about 15 minutes earlier than expected. Once I have worked all the 40m chasers I announced on 40m that I would now try 20m – around 14.285. As I was using the SOTABeams Band Hopper linked dipole, I had to lower the antenna to change bands and in doing so the antenna became stuck in some branches. Once I had cleared this up and raised the antenna again I tried again to self spot, this time with no success either via 3G or SMS on either Cell network. I decided to put out a call in any case and while 14.285 was busy, I found 14.295 was free and called there. After a couple of CQ calls I was called by Mikael as S5/PA3BHF he was on holiday from Reading in England (he has both Dutch and English calls) – in Sevinca in SE Slovania. Interestingly he had just happened to tune across the frequency (he is not a SOTA chaser) and called me and he was also using 5 watts from an FT-817 to a dipole! We exchanged 5-9/5-7 reports and chatted for 10 minutes. After this I put more CQs out without response and checked 14.285 and saw it was free and then put out a call there to which Don G0RQL came back with a very strong signal and offered to spot me on this frequency and that brought a few more contacts before I decided that with 30 minutes walk back to the car, I’d better pack up before the forecast rain caught me out. I finished up with 13 contacts for the activation, a little less than normal, but then when I took the antenna down it seems that I may have opened the 30m link on one side of the dipole instead of the 20m one, in the confusion with the antenna tangling up in the trees, so on 20m I would not have been radiating so well!. Don’t expect Cell phone coverage to stay constant. Despite having access to the two main networks in Germany – I did not have reliable coverage. 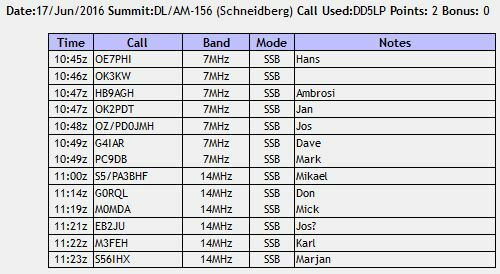 This entry was posted in SOTA and tagged DL/AM-156, Schneidberg, SOTA by VK2JI DD5LP G8GLM. Bookmark the permalink.